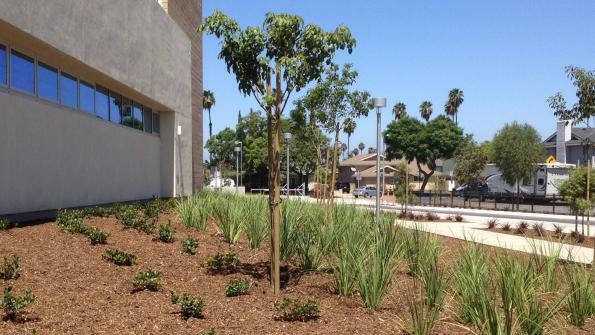 Agromin supplied 200 tons of its ES-2 mulch for use in a new school's planter boxes, around trees and in open spaces. The firm also provided 20 tons of its Garden Humus to amend the soil to give newly planted vegetation and trees the right start. During the two years that the new facility was under construction, students and staff relocated to the district’s old Keller Elementary School site. Newcomb Academy’s principal, Wendy Sowinski, says that while they didn’t face too many difficulties at the interim school, they are looking forward to the new campus. The new facility also includes all-new grounds. The school district is benefiting from a state-of-the-art landscape that withstands the daily rigors of a kindergarten-through-eighth-grade school, while helping save water to meet the stringent water restrictions imposed because of California’s 4-year drought. “The design goal for Newcomb Academy was specifically to save water and to create the least amount of future maintenance while still looking good,” says John Kay, owner of Land Engineering. The mulch was applied in August. Agromin’s ES-2 is made from organic recycled material collected weekly from residents’ green recycling barrels. The company removes non-green items (i.e., plastic bags, metals) from the material. It is then chopped and put into long composting rows where microorganisms and nature transform the material into compost in about 60 days. Click here to learn more about Agromin.